These 2 bedroomed Villas are ideally suitable for a family with 2 kids or 4 adults. From the veranda/terrace terrace offers a beautiful view over Kololo and Welgevonden. These villas are beautifully situated on the outskirts of Kololo, near the restaurant and pool. Last Minute offer: Book within 14 days before arrival and receive a 20% discount on your stay! 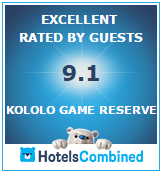 Kololo is the perfect destination for families with children: no dangerous animals reside on the reserve and children of all ages are welcome! Enjoy the perfect safari with you kids and receive 50% discount on a Welgevonden Big 5 Game Drive (3 hours)!